The Oakland Raiders announced Monday that cornerback Gareon Conley has been placed on injured reserve. Conley was the Raiders first-round pick this year, and had been dealing with a shin injury he suffered during the offseason. Conley was limited to two games and 92 snaps this season, and will finish his rookie year with a 79.6 overall PFF grade. He allowed four receptions for 35 yards in coverage, and his 0.63 yards per cover snap is sixth of 132 cornerbacks that have 50 or more snaps in coverage in 2017. 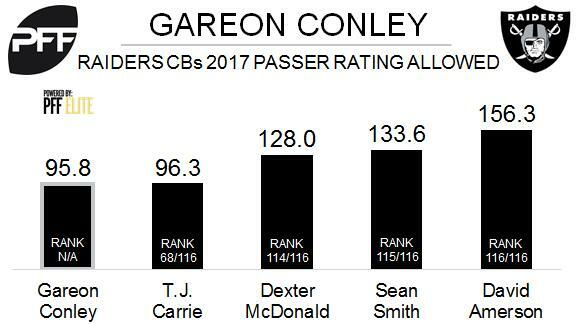 Outside of Conley, Raiders cornerbacks have struggled this season. Among 116 corners who have seen at least 100 snaps in coverage, Dexter McDonald, Sean Smith and David Amerson rank 114th, 115th and 116th, respectively in terms of passer rating allowed when targeted.